Most bird feeders come equipped with wire loops, integrated hooks, hanging ropes or other hangers. Knowing how to hang a bird feeder safely and securely is more than just using those hangers, however, and the right hanging is essential for the feeder to be convenient for both birds and birders. Not only is hanging a bird feeder a fast and easy way to add another food source to the garden or backyard, but a hanging feeder has several benefits that both backyard birds and birders can enjoy. 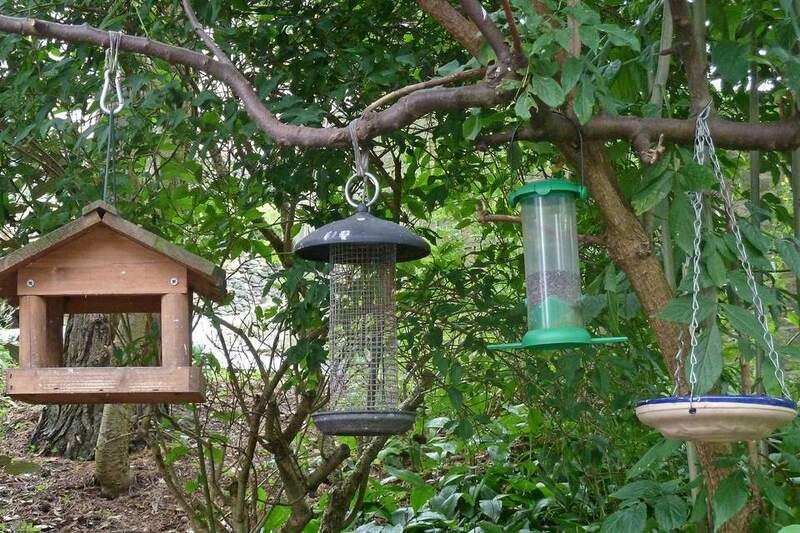 Ready-Made Design: Because most feeders are already designed to be hung, extra attachments or hardware is not usually required to hang the feeder. A simple hook or a length of twine or cord is all that is typically needed to hang a new bird feeder instantly. If the feeder already has a large enough built-in hook or loop, even that may not be necessary. Location Convenience: Hanging feeders can be hung from gutters, poles, garden hooks, trees, arbors, arches or other locations so long as a hook or cord can secure them. This allows these feeders to be positioned in many easy places for convenient refilling and satisfying bird watching. It also creates safe places for birds, which will readily visit. Off the Ground: When feeders are hung several feet above the ground, that height offers birds additional protection from predators. Hanging feeders are also less accessible to mice, and while creative wildlife may still access them, it is easier to protect hanging feeders from disturbances. Hung properly, feeders can even be inaccessible to squirrels or other popular raiders. Depending on a feeder's exact design and the hanging locations available in the backyard, it may be able to be hung without any additional accessories. Many feeders, however, do require an extra S-shaped hook or a length of twine or cord to hang appropriately and at a proper height. S-hooks are available from hardware stores, garden centers, and birding supply stores, and are available in different thicknesses, curvatures, and lengths. Choosing a hook with deeper, more strongly curved ends will hold the feeder more securely so it will not fall off the hook if it sways in the wind or when birds land on it. The cord to hold a feeder could be jute twine, rope, chain or similar material, but should not be elastic or springy, which could create excessive movement when birds use the feeder. The length will vary depending on how high the feeder needs to be hung, and if necessary, the cord should be firmly knotted several times to ensure it will not fall. Choose a location out of the strongest winds to minimize swaying that can discourage birds and spill seed. Also keep feeders away from busy traffic areas such as sidewalks and pathways where they could be bumped or tipped. Check the sturdiness of the hook, branch, pole or gutter where the feeder will be hung. Test that it will stay firmly secure even when the feeder is filled with heavy seed and visited by active birds. Ideally, hang bird feeders in shaded areas to protect seed, nectar, and suet from excessive spoilage. A lightly shaded location will also provide ideal lighting for watching or photographing birds without glare. Hang feeders near cover birds can use for shelter, such as a brush pile or nearby trees or shrubs, but not close enough for predators to be concealed and able to attack feeding birds. If squirrels are a problem, hang feeders at least six feet above the ground and 10-15 feet away from trees or structures where squirrels can jump. Other steps can also help make a feeder more squirrel-resistant. If needed to deter pests, you should use a baffle above a hanging feeder. This also helps shed rain or snow and keeps birdseed dry, so it does not spoil as quickly. Position feeders either closer than three feet or further than 10-15 feet from windows to minimize the risk of dangerous window collisions that can injure or kill birds. Check the feeder and its hook and cord regularly for signs of wear or damage that could cause the feeder to fall. It is easy to do this check each time the feeder is refilled. Remove hanging feeders during windy storms or other dangerous weather when tipping or falling is more possible. With proper care and precautions, it is unlikely that a hanging bird feeder will fall, but accidents do happen. When a feeder falls, scrutinize it for any damage, and if necessary, repair or replace the feeder. Examine the cord and hook to see if they can be reused, and check the location where the feeder was hung for any indication of problems that could cause additional falls or spills. Clean up spilled seed but do not refill the same feeder with it, because it may be contaminated or wet and could clog the feeder. Instead, if the seed is salvageable, add it to a platform or tray feeder or sprinkle it in a ground feeding area and refill the hanging feeder with fresh, clean seed. Hanging bird feeders are easy, convenient designs for many backyard birders to use. By knowing how and where to properly hang a feeder, it can provide years of fantastic birding and delicious, nutritious treats for backyard birds.